For June and July, the Library's seventh floor exhibit took a look at Regents Exams, which have been a staple of New York secondary education for over 100 years, since a statute in 1877 first authorized the New York State Board of Regents to give examinations as a standard for graduation from high school. 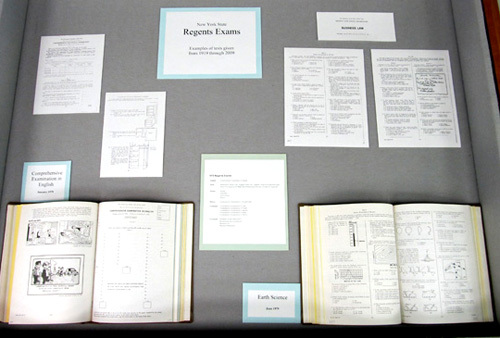 As official publications of the State, many past Regents Exams have been preserved in the State Library's collection of New York State Documents, and the June-July seventh floor exhibit featured examples of various exams covering a ninety-year period, ranging from 1919 to 2009. There have been many changes to the high school examinations over that period, most visibly in the number of exams offered and the subjects covered. In the first display case, a list of exams from the 1918-1919 school year indicated that over 80 tests were given, in about 40 subjects, There were multiple tests in many subjects, e.g. Elementary and Advanced Botany, or Second-Year, Third-Year and Fourth-Year French. Latin alone had eleven different exams, including Latin Grammar, Latin Prose Composition and Latin Verse at Sight! This emphasis on Latin (and Greek, for which there were four different exams) probably reflects an expectation of the time that students who planned to attend college should have an extensive classical education. Two questions from the Comprehensive Music exam from 1950. Those not planning to go on to college were not exempt from taking the Statewide exams, however; in addition to tests in traditional school subjects such as math, English, science and history, the 1919 exams also included tests for vocational subjects such as Bookkeeping and Business Practice, Commercial Law, Commercial Arithmetic and Typewriting. By the mid-twentieth century, the number of different examinations produced by the State had been significantly reduced. The list of exams from 1949 shows that about 30 high school tests were offered - less than half the number available 30 years earlier. In addition to the high school tests, some preliminary tests for seventh and eighth graders were still being produced. The reduction occurred because fewer tests were given in some subjects, such as Latin, while other subjects had been eliminated (e.g., Botany, Zoology, and History of Great Britain and Ireland). A variety of exams on vocational topics were still available, including a couple that hadn't been present in 1919: Comprehensive Vocational Agriculture and Comprehensive Vocational Homemaking. Question from the 1979 Earth Science exam. Thirty years later, the high school exams had been streamlined again. The list of exams for 1979 shows 21 tests given in 16 subjects. Some of the exams that disappeared between 1949 and 1979 were those for Music, Art, German and some vocational subjects. The collected exams from this year, though, include one exam - Ninth Year Mathematics - that was translated into Spanish. Fast forward another thirty years, and the list of exams offered in 2009 had been reduced to just 15. Some math and science exams, however, were translated not only into Spanish but into Chinese, Haitian Creole, Korean, and Russian as well. Even though it included fewer exams than the older examples on display, the book from 2009 was thicker, because by that time, the teacher instructions were considerably expanded for some tests. The teacher materials for the June 2009 exam in Global History & Geography, for example, included several sample essays, scored and analyzed, to guide teachers in grading the thematic essay that students were required to write. Question from the Korean translation of the Mathematics A exam from 2005. Regents exams, some going back to the late 1800s, are available as part of the Library's Digital Collections. More recent exams, from 1998 on, are available on the NYS Education Department's web site. For a more detailed history of the exams, see "Regents Examinations and Curricula" in James Folts' History of the University of the State of New York and the State Education Department.